A right and optimized code that makes the simplest static single page of plain text to the most complex web-based. Functional over cross platforms is called web development, we at W3care are well acquainted with the critical areas to address so that the product developed is best in its kind and, the right questions to ask that helps the organization to develop the right product and move in the right direction, & combine it with universally acceptable solutions, strong research techniques, and quality control mechanisms to give you across platforms web application which clearly reflects your business model & serves all your requirements exactly they were supposed to. All our projects begin with in-depth analysis & proper planning, followed by the use of carefully chosen project execution & management techniques to ensure the successful project delivery. In addition, we assign a dedicated project manager along with the project management team throughout the process to sample the sites to allow you to test concepts before they are finalized. We are here to make the whole process painless! We offer many services under Web Development area. CMS web development is one of best web development services. Content Management System(CMS) is a monitoring system that allows the admin with the rights to manage content which maybe in the form of text, embedded graphics, photos, video, audio, and code (e.g. for applications). It is used to create, manage, store and deploy content on website pages. CMS development services even allow the administrator to manage the content of the website during runtime. The content can be in the form of text, images, products, videos etc. in different languages. The content management system facilitates you with ability to manage your website or a part of it on your own or with the help of your stakeholder. This finally tags for a smart decision of onetime investment for the production of a functional website and modify it as and when needed. W3care is specialized in developing user-friendly and powerful content management system to help you manage the entire workflow of your organization. We develop and integrate top of the line Content Management Systems. Working on the popular ‘What You See Is What You Get’ model, CMS enable you to update the web presence in the most user-friendly manner. You could get in touch with us to share your business need with us and we shall suggest an optimal solution for you! Are you an organization which is based on the booking or reservation of an event in the form of tickets, passes etc.? You have knocked the right door. That is exactly what a booking engine developed by W3care aims to deliver. Our team can develop the most comprehensive booking engine solutions prevalent in the market with hotel booking, real estate property websites, travel portals etc, & product websites with an extremely simple yet a very powerful way to sell rooms, tour packages, properties and other. Please contact us if you are looking for a web development partner for your booking engine. Integrating the ecommerce functionality with the website requirement from the client and providing ideal solutions to make it functional. We are equipped with the proficiency of integrating several online payment carts also known as payment gateways. We have developed series of E-commerce solutions that you can go through in our portfolio section. We develop EIP solutions for organizations which are secure and are designed to aggregate and personalize information through application-specific portals. These solutions are de-centralized content contribution and content management, through which you can keep the information always updated. It caters for customers, vendors and others beyond your organization’s boundaries. This contrasts with a corporate portal which is structured for roles within an organization. If you are looking for a company who can develop an enterprise information portal (EIP), for your organization at affordable price then you can contact us. Load time to create a seamless experience for mobile users. OR, if you want to develop new mobile website then also we can serve you. You can contact us and we will suggest you the best plan to develop/convert your website into mobile friendly environment. 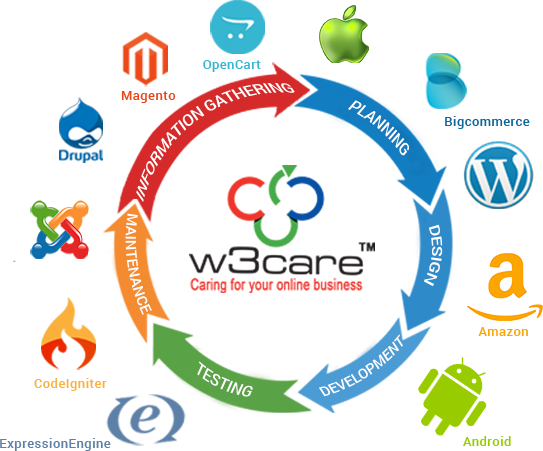 W3care Technologies is a well known company for web development services worldwide. We work on all major CMS and frameworks. We are developing website on many platforms since 2010 and have delivered hundreds of projects successfully. Our teams work with passion and dedication to provide unique design & perfect functionality to beat your competition. We have developed for all major industries. I have been really impressed by the service delivery of the W3Care team. I was initially very hesitant about having some of our development work done out of the country but I have been very glad we did. My concerns that outsourcing would increase risk and reduce control turned out to be completely unfounded. The project was completed on time (when does that ever happen?!) and the communication throughout was better than any I’ve ever experienced. We got daily updates from Navneet, the developer on our project, and the CEO, Satya, would pop through an email every couple of days checking if things were ok (again, when does a CEO ever bother with a small project?!) Payment was done via Paypal so there was no risk. A minor error that occurred on our website a month after the project was completed was fixed without quibble less than 40 minutes after we reported it. Outstanding!